With digital signage, ultimately, content defines the end result of your efforts at gaining customer attention and effectively communicating key sales and marketing goals. But remember in the end what you are actually creating is a digital signage presentation. So, what’s the case for using PowerPoint for digital signage? In this article we’ll explore the case and present the benefits, point-by-point, of using PowerPoint for digital signage in your business. We will also introduce PowerPlayer, a low-cost Windows 10 PC stick that displays PowerPoint presentations on any standard TV. It’s a complete digital signage solution that includes cloud-based content management. Why not look at PowerPoint®, one of the premier tools for creating high impact multimedia presentations? PowerPoint offers flexible drag-and-drop screen layout, broad multimedia content support, a wide range of free (or very low-cost) digital signage design templates and ease of use. And again, let’s not forget the most important feature, ease of use, which is a key requirement for small business. PowerPoint is also a software tool that most business people already own and know how to use. Converting PowerPoint for digital signage is fairly simple: setup the slides to display for a specified time (say, 10 seconds each) and select kiosk mode to run the PowerPoint full-screen in a continuous loop. Now your PowerPoint is ready for standalone TV display. PowerPoint provides everything needed to create cutting-edge multimedia digital signage. You can create a signage presentation that displays a compelling mix of high definition video, pictures, a wide range of colors, text fonts, animation and page transition effects. PowerPoint makes it easy for non-technical users to create digital menu boards, interactive kiosks, lobby and retail displays. PowerPoint does not preclude using professional content creation tools like Adobe Photoshop and Illustrator to design exacting (down to the pixel) digital signage presentations. Simply import Photoshop or Illustrator page content into your PowerPoint presentation. If you want to create a cutting-edge video advert you can use editing tools like Adobe Premier, as PowerPoint supports the import and playback of standard h.264 MP4 video files in presentations. In this way PowerPoint becomes a multimedia container and media player. Mix and match the imported “pages” along with your standard PowerPoint page content to create a seamless digital signage presentation with very cool page transition effects. It’s clear that PowerPoint provides a compelling, easy to use tool for creating multimedia digital signage presentations. So far, so good. But what about operating cost? Won’t you have to purchase a PowerPoint license for each TV point? This sounds expensive. And there is a simple answer: use the free Microsoft PowerPoint Viewer. The Viewer can display PowerPoint presentations on your TV without the need for a PowerPoint software license. Some of you are thinking: don’t you need a Windows PC to display PowerPoint on a TV? Yes you do, but there is a new generation Windows PC that is ideal for digital signage display: the PC stick. 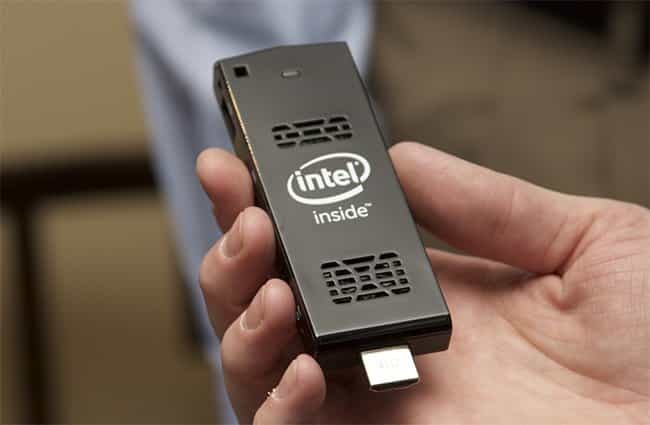 A PC stick–also known as an Intel compute stick–is a small (pocket-sized) Windows-based device that plugs into your TV’s HDMI port, and (with the right software) is capable of displaying PowerPoint presentations. Along with their small size comes a low price. You can purchase a variety of compatible PC or compute sticks between $100 to $149 from stores and online retailers. These PC and compute sticks include a Windows license, a flash hard drive, USB ports and WiFi Internet capability. 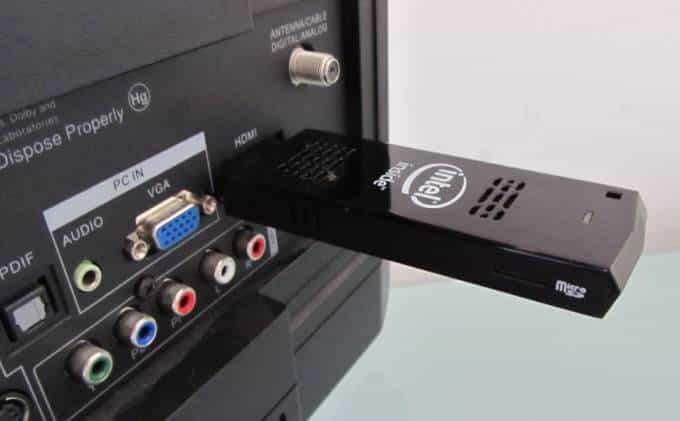 To display PowerPoint plug the PC stick into your TV’s HDMI and install the appropriate digital signage player software. It’s the player software that enables the PC stick to display PowerPoint digital signage presentations on your TV. One of the common complaints against using PowerPoint for digital signage is the lack of a content management service (CMS) that supports PowerPoint files. Without a CMS you are reduced to updating your signage content by manually copying presentations files onto each PC/TV point. And how do you support things like signage display schedules or remote management? Without a CMS you can’t. The lack of a proper PowerPoint CMS was the primary reason we developed PowerSignage™. PowerSignage is a cloud-based CMS designed specifically for PowerPoint. PowerSignage provides cloud storage and supports the native PowerPoint file format: there is no need to convert PowerPoint into video or export it as a set of static image files. PowerSignage CMS makes it easy to upload, schedule and display PowerPoint digital signage presentations on you TV screen. Now you know the benefits of using PowerPoint for digital signage and how to make presentations suitable for TV display. But what’s the best, simplest and most cost-effective way to display PowerPoint on your TV screen? You should take a look at PowerPlayer™, an innovative Windows 10 PC stick that displays PowerPoint presentations on any standard TV. It’s bundled with our PowerSignage CMS, providing a complete, easy to use digital signage solution that’s ideal for small business. PowerPlayer automatically downloads the PowerPoint digital signage presentation from our CMS and displays it on your TV screen. PowerPlayer is PowerPoint TV plug-and-display ready. And to keep operating cost down PowerPlayer uses the free PowerPoint Viewer to display signage presentations, so there is no need to purchase a PowerPoint software license for each TV point. PowerPoint is a compelling content creation tool for digital signage. Through its flexible layout manager, wide multimedia support and page animation/transition effects you can create effective digital signage presentations with minimal effort. Add to this the wide variety of free and low-cost PowerPoint digital signage templates and you have an exceptionally powerful tool for creating professional, great looking digital signage. Finally, we have PowerPlayer, a very affordable, complete solution for creating, managing and displaying digital signage on your TV using PowerPoint. All these features and benefits make a strong case for using PowerPoint for digital signage–especially for small business. For more information on using PowerPoint for digital signage please download and review our PowerPoint for Digital Signage Guide. For more information on PowerPlayer please review our product brochure or visit our website at www.powerdigitalsignage.com. Microsoft and PowerPoint are the registered trademarks of Microsoft Corporation. PowerSignage and PowerPlayer are trademarks of Power Media Design Pty Ltd. All other trademarks are the property of their respective owners. Copyright Ⓒ 2017 by Power Media Design, all rights reserved.